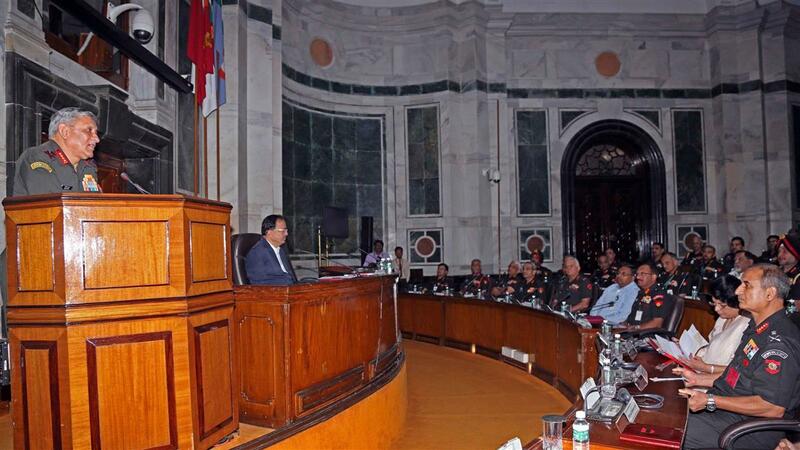 In the opening address of the biannual Army Commanders’ Conference which commenced on 16 April 2018, the Hon’ble Raksha Rajya Mantri, Dr Subhash Ramrao Bhamre complimented the Indian Army for its contributions in countering myriad security challenges, thus, paving the way for development and progress of the Nation. He appreciated the Army for continuous training activities undertaken including various joint trainings and exercises with friendly foreign countries. He stressed upon the need for being prepared for highly dynamic internal and external security challenges. Dr Bhamre emphasised that the Government was fully seized of the requirements of the Indian Army regarding capability development, force modernisation and above all, infrastructural development. He reiterated the need to optimise the fiscal resources through synergised capacity building within the three services through enhanced indigenisation and self reliance. 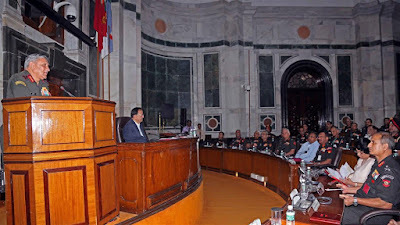 General Bipin Rawat, Chief of the Army Staff, in his opening remarks, stressed upon the need to work in a collaborative manner for retaining and enhancing the current levels of combat effectiveness. He gave emphasis on the need to lay down judicious priorities to ensure that the allocated resources are utilized optimally and the force modernization be carried out unabated. During the Conference, chaired by Chief of the Army Staff, the senior commanders will deliberate on the management of the extant security dynamics, mitigation of future security threats and enhancement of combat edge over potential adversaries. Other issues like infrastructure development for capacity enhancement along the Northern borders, review of strategic railway lines, optimization of limited budget to ensure making up of critical deficiency in ammunition, issues related to Border Road Organization projects, ECHS, as also other matters relevant to operations, administration and welfare of troops will be discussed in detail for planning and execution.